Festival Albertine is a diverse cultural and literary event that took place at Albertine Books in New York, November 2 through November 6, 2016. "The absence of hierarchy is freedom." 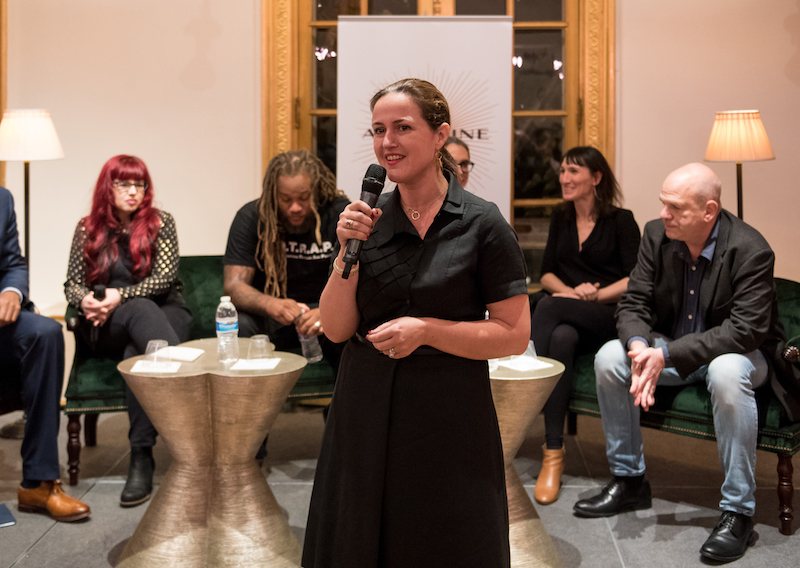 On the second night of Festival Albertine in New York panelist and comic book artist Catherine Meurisse reflected on the capacity of art to dismantle traditional power structures. The evening's panel - From the Margins to the Mainstream: High Art vs. Low Art in France and the US. 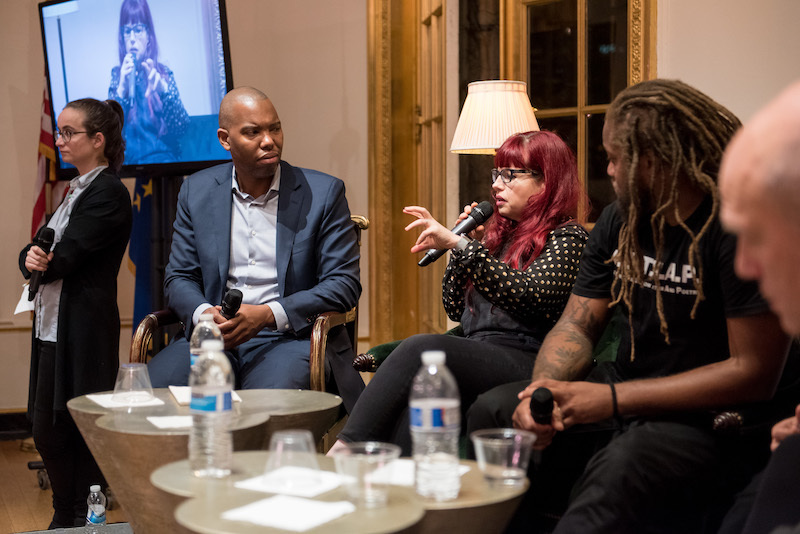 - featured Kelly Sue Deconnick, D’de Kabal, Catherine Meurisse and David Simon in a panel moderated by author Ta-Nehisi Coates. 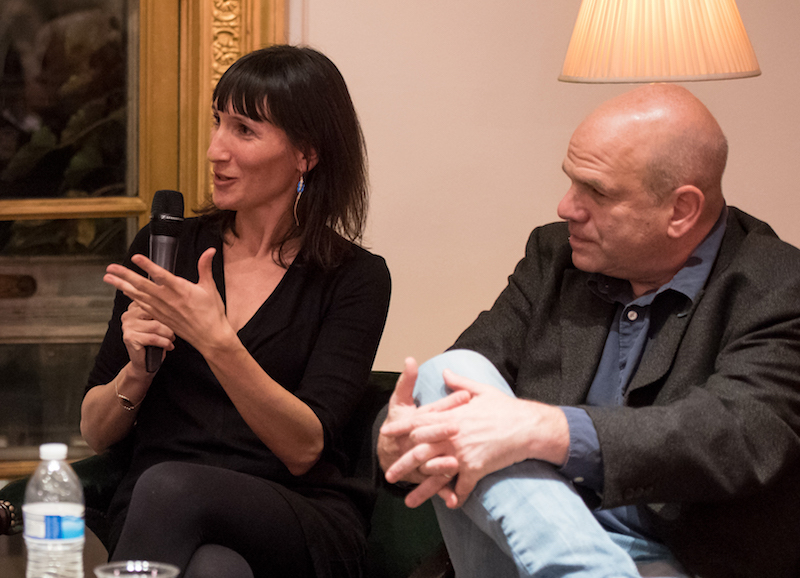 In a far-reaching discussion of art and the freedom and beauty it permits, the panelists touched on popular art forms, the catharsis of producing art, the beauty in chaos and finding inspiration in dark places. Meurisse, a survivor of the Charlie Hebdo attack in Paris last year, also talked about the possibility of erasing chaos and pain with beauty. “In my work, people say I’m very, very dark. But expressing darkness in words, nothing can happen to you. You transform (it) into something you can share,” said musician D'de Kabal. Kabal offered LSP an exclusive audio recording of his spoken word art after tonight's panel, as featured at the top of this page. 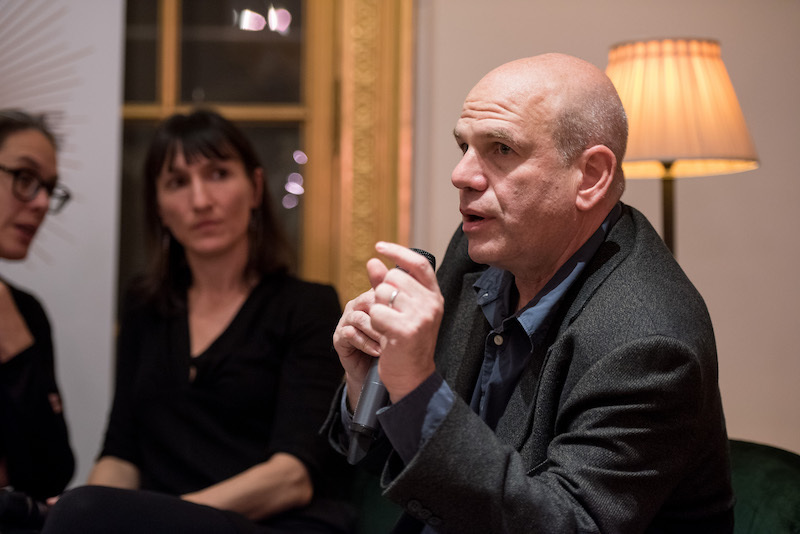 For David Simon, the mastermind behind cult television series The Wire, the absence of visibility of an audience means freedom. In a video interview after the panel, Simon expounded on his admiration for Honoré de Balzac, the genius 19th century French novelist known for his inimitable descriptions and morally ambiguous characters, and added that Balzac could have liked The Wire, or at least "would recognize [its] intent to acquire a city, slice by slice." Comic book writer Kelly Sue Deconnick, meanwhile, made a pitch for the so-called low art form: "I think if we dismiss the potential of popular art, we dismiss the potential of the populist." “Because we see comics as superhero comics in this country, we have a tendency to be very dismissive of them as adolescent boy fantasies. While there are a number of comics that have well-earned that, I think… I think if we dismiss the potential of popular art, we dismiss the potential of the populace." "I always talked about this. There is no classification of art. At the Charlie Hebdo team, there was no hierarchy. The absence of hierarchy - it’s freedom." "I started to write rap songs that were 30 or 40 pages..."
"Where there's theater (performance, there's already hip hop. And where there's no theater, there is hip hop too." "I grew up thinking television was death…Television was empty. So if you had said to me, ‘you’re going to end up being a television writer,’ I would’ve been like, ‘where did I go wrong?’"
"The attacks on January 7th questioned the position of the illustrator/artist in France, in society, and in the world at large." "To try to understand: although I believe I will never be able to fully understand and to give a meaning to my life as an artist, I decided to take drawing even more seriously and to continue working on books more than on drawings for the press - the types of works that need slower rhythm to try to dilute my suffering, sorry and melancholy. It's at the heart of my latest graphic novel that was published in the spring in France, called La Légèreté (Lightness). "What happened on the 7th - I arrived at the very moment when my friends were being killed. And like my other surviving friends, I tripped into this world of the indescribable, the unspeakable...I really believed that I would never ever be able to draw again. I believed that my drawings had been gunned down with all my friends. In my book, I talk about how I try to re-conquer this desire to draw." "What struck me as being so essential after January 7th, was the search for beauty. And I hung on to that word that I was really searching for so desperately during the whole year of 2015 because I was so convinced that this search for beauty and this amazing aesthetic shock would allow me to erase the shock of January 7th. So for that reason I went to Rome,... I saw the city, I saw Caravaggio... And what happened, in fact, is that I was so convinced that beauty was the opposite of chaos, but then I ended up finding that there is chaos in beauty. During my first strolls around Rome, I saw marble, dismembered or damaged by time and seeing these damaged bodies, I would see the bodies of my friends. Except there was nothing sordid or morbid about them, because these bodies were also magnificent. So I realized that art is a mediation for me. That s what I talk about in my comic book, because in this media, you can explore anything." In a "television narrative, they want to keep you coming back, there is comedy... And redemption - redemption is the most oversold thing – and whatever problems we place in front of you by the end, they will be conquered because... That makes you come back in the next hour." "The only way to liberate yourself from that, the best narrative, the best art lives with the chaos you are describing and also the imperfect politics of the new world." "In my work, people say I’m very, very dark. But expressing darkness in words, nothing can happen to you. You transform (it) into something you can share. I balance the energy, the darkness." "Nothing makes people more stupid than money – there’s so much money to be made in the television industry, you gotta to keep your audience." On The Wire, "we were a little insulated from that... The only time the HBO executives would come to Baltimore is when their plane was on the way to Paris, and then crash. That was it. They never visited. I had more visits for Treme in New Orleans. The Wire? We were sort of an afterthought until we were not. And god bless them, because they let us keep going. We were okay with the idea of not maximizing our audience, which is a reckless way to think about things." "They got rid of the advertisers. That was a fundamental... You know, when you had to stop every twelve and a half minutes to sell soap and blue jeans and cars…and when you had to keep people in the mood to watch those commercials and buy that stuff – when that was the job of programming, um, you couldn’t be... You had to get rid of that. And HBO, and not just HBO, but premium cable, the idea of we’re gonna take some portion of subscription money and we’re gonna fund programming with it, and the trick will be, is that you won’t see it anywhere else. We’ll use the naughty words and the naughty bits, and we’ll have a little more violence. And there’s no denying that that was some of the currency." KELLY SUE DECONNICK: “Women are not new to comics. I can teach any man about power fantasies. Our memory is so incredibly short." TA-NEHISI COATES: "Even as you try to escape [misogyny], you are within it. But I think it's at least a step ahead to be conscious of it." D' DE KABAL: "What feminism has created, it's like a big book for us [men] to read, to question ourselves." DAVID SIMON: My newest project, The Deuce, is "a critique of capitalism, but ultimately it's a deep dive into misogyny." DS: “You know what, I’m not sure he would have…he was such a great prose writer and so... Honoré de Balzac, his sympathies were with the ruling class ostensibly, and yet he was so humanistic he couldn’t help but embrace the point of view of everybody he wrote about. That’s what makes those books powerful. And I think, while he was such a good prose writer, he might find some distaste in the shorthand of film. Film is much more reductive in some ways... There’s no interior voice of the writer in film, unless you do voice over. It’s just what’s on the screen. And he may have looked at it and gone, ‘What is this form of storytelling? You know? Can’t you tell a proper novel?’ He might have done that, but I think he would recognize, if I can indulge myself for a moment, I think Balzac would recognize our intent in trying to acquire a city, slice by slice, and have our allegiance be with whoever we’re writing about, regardless of their class or their station in society... Yes, he was welcome in the salons, he was welcome among the ruling class, but when he went down to be with the shopkeepers, he got there. He got there completely. He’s a great writer." Photo credit : Ian Douglas.